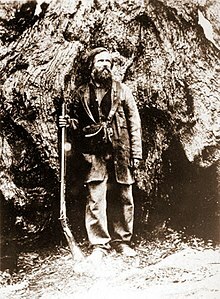 Galen Clark, the first guardian of Yosemite Valley and the Mariposa Grove, pictured in front of the Grizzly Giant Tree, Mariposa Grove around 1858-9. For over 3,000 years Sierra Miwok, Mono, Paiute, and other Native American groups have lived in the central Sierra Nevada region of California. When European Americans first visited the area that would later become Yosemite National Park, a band of Native Americans called the Ahwahnechee lived in Yosemite Valley. The California Gold Rush in the mid-19th century greatly increased the number of non-indigenous people in the region. Tensions between Native Americans and white settlers escalated into the Mariposa War. As part of this conflict, settler James Savage led the Mariposa Battalion into Yosemite Valley in 1851, in pursuit of Ahwaneechees led by Chief Tenaya. Accounts from the battalion, especially from Dr. Lafayette Bunnell, popularized Yosemite Valley as a scenic wonder. In 1864, Yosemite Valley and the Mariposa Grove of giant sequoia trees were transferred from federal to state ownership. Yosemite pioneer Galen Clark became the park’s first guardian. Conditions in Yosemite Valley were made more hospitable to people and access to the park was improved in the late 19th century. Naturalist John Muir and others became increasingly alarmed about the excessive exploitation of the area. Their efforts helped establish Yosemite National Park in 1890. Yosemite Valley and the Mariposa Grove were added to the national park in 1906. The United States Army had jurisdiction over the national park from 1891 to 1914, followed by a brief period of civilian stewardship. The newly formed National Park Service took over the park’s administration in 1916. Improvements to the park helped to increase visitation during this time. Preservationists led by Muir and the Sierra Club failed to save Hetch Hetchy Valley from becoming a reservoir in 1923. In 1964, 89 percent of the park was set aside in a highly protected wilderness area, and other protected areas were added adjacent to the park. The once-famous Yosemite Firefall, created by pushing red hot embers off a cliff near Glacier Point at night, was discontinued in the mid-to-late 20th century along with other activities that were deemed to be inconsistent with protection of the national park.